The ERTRAC Plenary gathers all the ERTRAC members three times a year. The plenary is responsible for defining the strategic orientations of ERTRAC, and to enable a shared vision from all the Road Transport stakeholders. The Plenary adopts the ERTRAC documents, and decides on the strategic approaches for the technology platform. The ERTRAC Executive Group is formed by the Chairman and the Vice-Chairmen. It is responsible for the daily decision-making of the technology platform and takes all necessary decisions for its functioning in between the Plenary and Steering Group meetings. The members of the Executive Group represent ERTRAC in public events and consultation bodies. They chair the Plenary meetings. 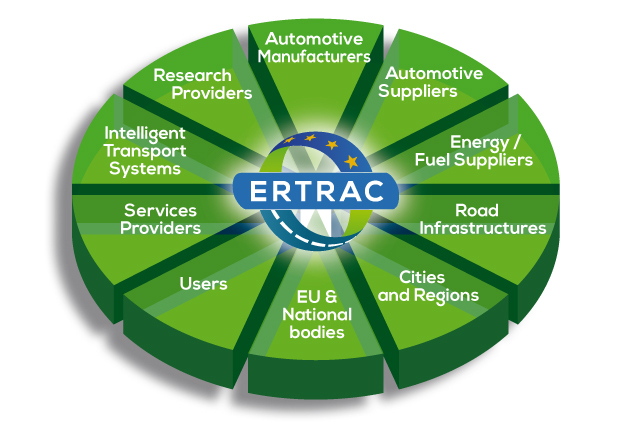 The ERTRAC Secretariat is responsible for the daily management of the technology platform, such as the organisation of meetings and communication activities. It reports directly to the Executive Group, and assists all the bodies of ERTRAC. The ERTRAC Supporting Institutions Group (ERTRAC SIG) is a non-profit association, legally established in Belgium (AISBL), supporting ERTRAC by financing its activities (office, secretariat costs, meetings and events costs, etc. ).